As predicted by many in the analytical community, the last day of the month saw U.S. crude posting its best January ever with a surge of over 18 percent, breaking a three-month losing streak and despite ongoing concerns about slowing global growth and weakening fuel demand. 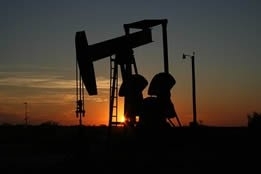 West Texas Intermediate on Thursday declined 44 cents to $53.79 per barrel, still enough to achieve an 18.5 percent monthly gain, its biggest jump since April 2016 and its best January since the futures began trading in 1983; Brent rose 24 cents to $61.89 per barrel, finishing January up 15 percent (also the best monthly gain since April 2016). The cause for Thursday's declines was the Energy Information Administration reporting that U.S. oil production rose to an all-time high 11.9 million barrels per day (bpd) in November, up from 11.5 million bpd in October; traders also reacted negatively to U.S. president Donald Trump saying he may not be able to reach a trade deal with China by March 1, the deadline to prevent a rise in tariffs on hundreds of billions of dollars in goods. In assessing Thursday oil market performance, Craig Erlam, senior market analyst at OANDA, observed that "A break through $55 in WTI and $65 in Brent would be a very bullish signal for these and could be the catalyst for more significant upside, with oil having stabilized over the last few weeks following the post-Christmas bounce." Several bullish factors support Erlam's observation, such as the Federal Reserve saying it will be "patient" in raising interest rates, thus pushing down the U.S. dollar (which would make crude more affordable to holders of other currencies); crude is also being supported by the U.S. sanctions against Venezuela's state-owned PDVSA oil company. However, the seemingly unstoppable juggernaut of U.S. shale production is widely viewed as the monkey wrench that could easily prevent a price breakout: Mike Kelly, head of exploration and production research at Seaport Global, said, "The accounts that we talk to say that, really, to want to get involved in oil, I have to see the world's swing producer - which is now us here in the U.S., the shale guys - they have to temper their growth a little bit." He added, "We can't grow at 2 million bpd year-over-year here in the U.S. if demand is growing at potentially half of that." Another factor that may well influence traders in the shorter term - as quickly as within a few days - is the announcement that France, Germany, and Britain have put in place a mechanism that will allow the European Union to circumvent U.S. sanctions and allow trade between the EU and Iran without relying on direct financial transactions. While the mechanism known as the Instrument in Support of Trade Exchanges is focused on the pharmaceutical, medical devices and agri-food goods sectors, it is said that it might be expanded to include other industries in the foreseeable future.